It’s hard to believe that we find ourselves in the month of April, with the 2018 National Hockey League Entry Draft now less than three months away. Given how close the 2017-18 season is to its end, the vast majority of elite prospects within this year’s class have solidified their place within various draft rankings, my own included. With every major international tournament, showcase, and prospect game now in the rearview mirror, movement within each and every ranking proves extremely hard to facilitate. However, there is always room for small tweaks and alterations, and that is what exactly what takes place in my NHL Draft Ranking for the month of April. Although no prospects rose or fell considerably in this month’s edition, a select few did manage to ascend owing to their consistent play throughout the season. On the other hand, a few notable and potentially overrated prospects fell slightly this month — declines enforced largely by the improvements of others. As always, I have chosen to highlight and profile particular prospects eligible for this year’s draft. Speed, skill, and high-end talent are abilities highly coveted by NHL franchises, and perhaps no player represents these qualities better than Adam Boqvist. Although his 2017-18 season was played largely in the shadow of eventual first-overall selection Dahlin, Boqvist has continued to establish himself as a world-class defender of immense potential. 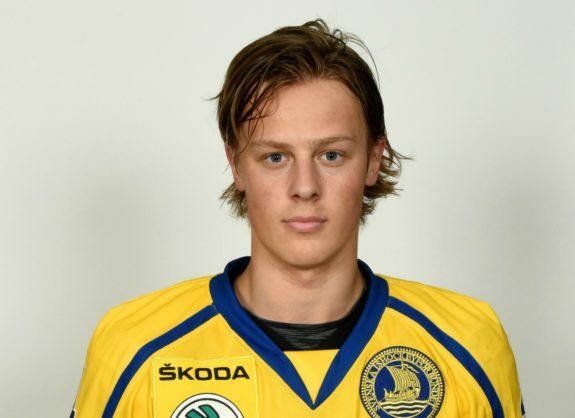 Incredibly deadly in the offensive zone and more than capable of holding his own defensively, Boqvist boasts SHL experience at the young age of 17-years and has shown no signs of slowing down. Incredibly creative, deceptive, and endlessly talented, Boqvist’s complete game should allow for his quick and seamless transition to the NHL-level in the near future. Capable of dictating the pace of play and able to control the outcome of any given game, Boqvist’s on-ice impact has become as impressive as it is overwhelming. Evan Bouchard’s 2017-18 OHL campaign was defined by nothing other than success. 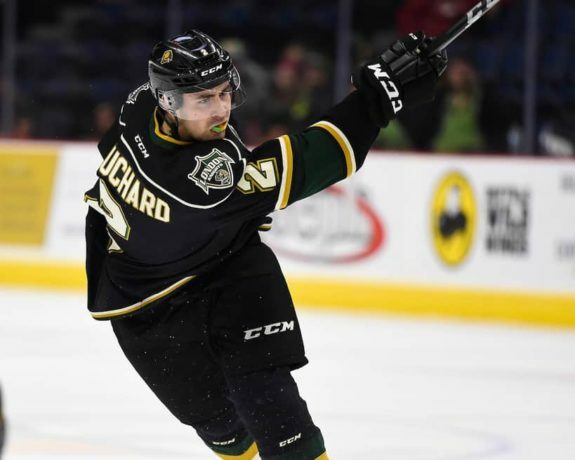 In his third season of play with the London Knights, Bouchard exploded at both ends of the ice. Defensively, Bouchard developed into one of the league’s top defenders, utilizing his size, strength, and ability to read plays in order to protect his own zone with remarkable consistency. Further, on offence, Bouchard established himself as a lethal blueliner capable of driving the Knights’ offensive attack from the back end. In fact, Bouchard tallied 25 goals and a whopping 87 points in just 67 games played this season — a total which stood by and far as the greatest of any league defenceman. Further inflating Bouchard’s value as a prospect was his ability to play a mature and professional style of game. Incredibly intelligent on the ice and well aware of his few limitations, Bouchard played to his strengths and worked hard to improve upon his weaknesses. It is Bouchard’s willingness to learn, adapt, and improve which will see him selected much higher than originally thought. 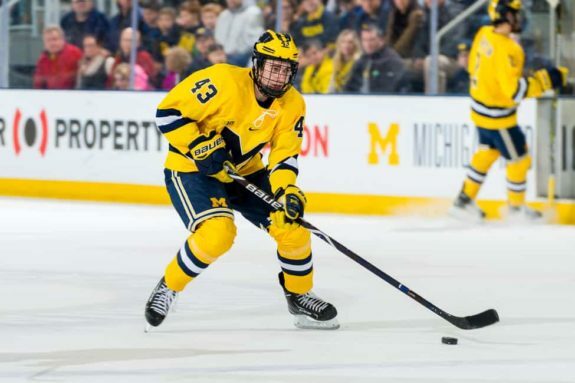 High-end speed and captivating skill define Quinn Hughes’ game. Although slightly undersized, Hughes compensates for this perceived deficiency through his highly lethal style of play. More than willing to join the rush, Hughes loves to push the pace of play yet also boasts the ability to control it through his remarkable composure and poise with the puck. Gifted with excellent vision, the ability to move the puck without hesitation, and a developing shot, Hughes has come to stand as a dominant force on the blue line despite his young age. And, while many offensive defencemen tend to sacrifice their defensive responsibilities in order to pad their point totals, Hughes is the complete opposite. Yes, he has amounted impressive offensive totals everywhere he has played, however, Hughes only thinks offence once he has done his job defensively. Unlike a number of other defenders available for the 2018 NHL Draft, Hughes ensures the well-being of his own zone before jumping into the rush in search of scoring chances. As one of the most complete defencemen available in the 2018 NHL Draft, it should come as no surprise to find Noah Dobson ranked as a top-10 prospect. Excellent within his own zone owing to his intimidating size and strength, Dobson can dominate his opponents physically and is calculated in doing so. Further to his size, Dobson is fleet-footed and can navigate the ice with ease, using his speed and agility to smother attacking forwards before securing possession of the puck.
? Most Valuable Player // Joueur le plus utile à son équipe ? What’s more is that Dobson has steadily developed into a devastating threat from the blue line. Boasting the ability to pass the puck as well as pound it on-goal, Dobson stands as a true two-way threat and one capable of performing in a variety of situations. 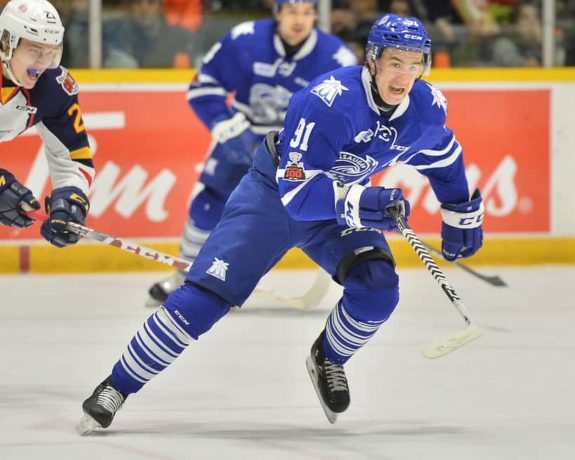 In fact, in addition to his stellar defending, Dobson notched an impressive 17 goals and 69 points in 67 regular season contests with the QMJHL’s Acadie-Bathurst Titan — the second-highest total by a defenceman. Although he is likely to be selected within the top-10, Dobson — in my opinion — stands as one of the 2018 NHL Draft’s most under-appreciated prospects. Ryan Merkley is, without question, one of the most highly skilled defencemen available in the 2018 NHL Draft. Unfortunately, he’s also one of the most incomplete, as his growing defensive game has hindered his overall progression as a player. In the offensive zone is where Merkley is the most potent, as his impeccable skating abilities and creativity with the puck allows him to generate high-quality scoring chances with relative ease. Further, Merkley owns a deceptive shot which he can float on-goal with regularity — an ability which creates havoc for opposing defenders due to the number of rebounds Merkley can create for his teammates. 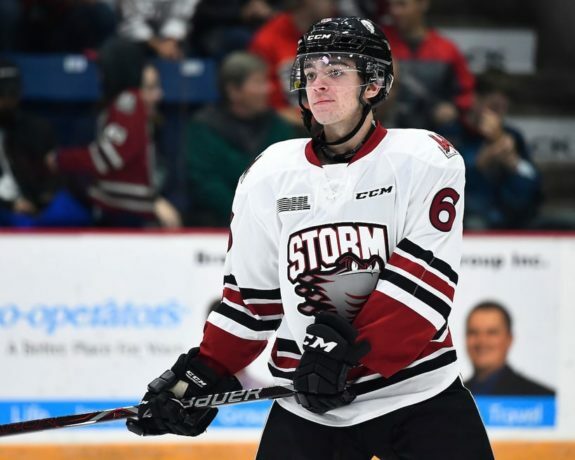 With this being said, it should come as no surprise to learn that Merkley recorded 54 assists and 67 total points in 63 games played with the Guelph Storm this season. However, if Merkley wishes to become a reliable defender at the NHL-level, he will need to learn to pair his offensive prowess with a much stronger and complete defensive game. Regularly caught in the midst of an offensive rush and unable to back-check in time, Merkley must work to improve his situational play and ensure his thirst for offence does not neglect his responsibilities on defence. 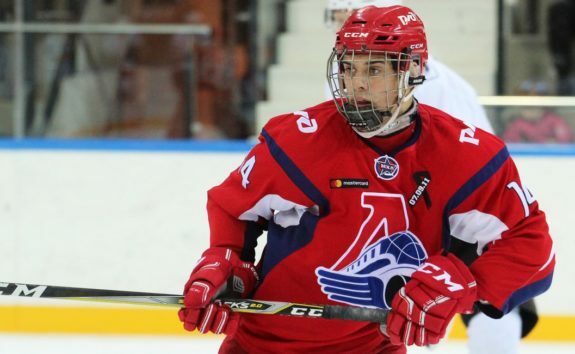 Joseph Veleno is one of the most interesting prospects available in the 2018 NHL Draft. 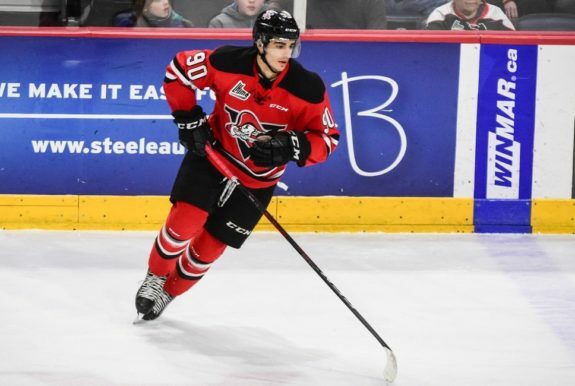 Despite being awarded exceptional status by Hockey Canada prior to the 2015-16 QMJHL season, Veleno has yet to truly establish himself as an extraordinary prospect. While he has certainly shown flashes of brilliance, the native of Montreal, Quebec has — thus far — failed to overwhelm his opposition with his speed, skill, and offensive ability on a nightly basis. In fact, Veleno’s recent 2017-18 QMJHL campaign marked the first season in which the youngster was able to record more points than games played, a reality which has reinforced Veleno as a highly capable two-way player rather than an elite offensive performer at this point in time. At the age of 18-years, however, there remains considerable room for improvement with regards to Veleno’s overall game. Strong on his skates, speedy, and of significant size, Veleno boasts all the tools of an elite NHL prospect, he simply needs greater time to combine his abilities. After all, there is a reason why Veleno was able to accomplish a feat which the likes of Sidney Crosby and Nathan MacKinnon could not. If you find yourself wondering who Grigori Denisenko is, don’t worry, you are not alone. Despite his projection as a likely second-round selection to begin the 2017-18 season, Denisenko’s strong and consistent play has allowed him to rocket up respective draft rankings. In fact, Denisenko is now expected to be chosen in the first-round, with his potential selection within the top-15 seemingly all but secured. Having drawn comparisons to Artemi Panarin of the Columbus Blue Jackets, Denisenko’s game is founded upon efficient skating and excellent puck-handling abilities. As a terrific passer who can navigate the ice with ease, Denisenko boasts a deceptive shot and the unique ability to meander through his opposition with speed while retaining control of the puck. As a dynamic offensive player and creative threat, Denisenko’s consistency and proven ability to compete against older competition should facilitate his seamless transition to the professional level. Although he will certainly endure a learning curve upon his arrival in North America, Denisenko owns the raw skill necessary to one day flourish at the NHL-level. This year’s class of goaltending prospects is not strong. It’s no secret. However, despite the diminutive attention being paid to these young netminders, there does, in fact, remain a handful of tremendously talented backstops available for selection. Leading the way in 2018 are the likes of Jakub Skarek, Alexis Gravel, and Jacob Ingham — three goaltenders of ample size, skill, and athleticism. In addition to these three young prospects is the presence of Olivier Rodrigue, who is arguably the most talented young netminder available in the Draft. Currently competing in his second season of play with the QMJHL’s Drummondville Voltigeurs, Rodrigue is an incredibly athletic goaltender whose strength and lightning quick reflexes have led to his successful sophomore campaign. 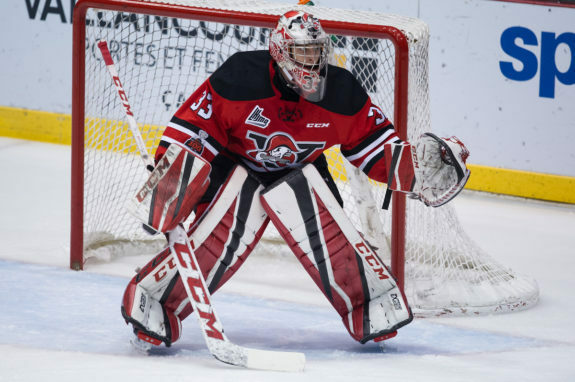 Projected to be chosen in either the second or third-round of the coming Draft, Rodrigue’s composed play and general stability within the crease should lead to a long professional career. As mentioned earlier, this month’s top-31 prospects are eerily similar to those identified in March. However, two prospects have fallen out of the top-31 this month, and have been replaced by a couple of increasingly promising Swedish sensations. With this being said, don’t forget to brush up on 10 of this year’s vastly underrated prospects, as any and all of which could force their way into the top-31 before the season’s end.